The problem with self-driving cars is that they can't be around non-self-driving cars, in real-world environments, until we're confident they're safe. And the only way to test them in real-world environments is to put them in one, immediately making us unsafe. It's a Catch 22 that Ford is trying to overcome by building an entire neighbourhood where tests can be done in a controlled way. The32-acre site, named Mcity, is at the University of Michigan, a State formerly famed as the cheese capital of the USA and home of the Fonz. 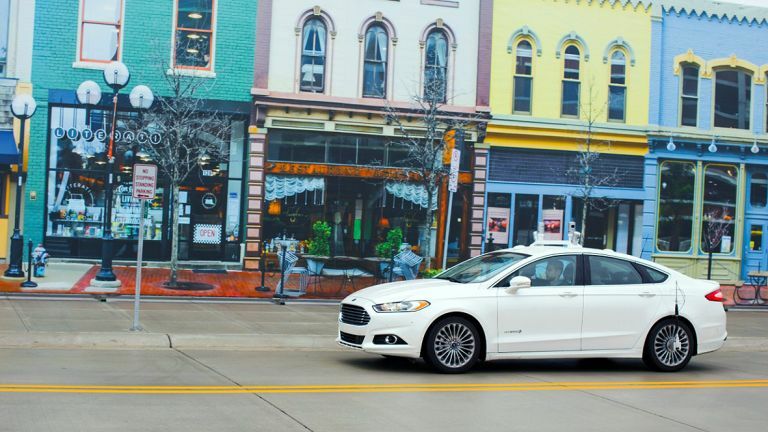 Part of Ford's Smart Mobility programme, this ghostly new town is home to theFusion Hybrid Autonomous Research Vehicles. These KITT cars are loaded upwithcameras, radar and LiDAR - laser sensors that help to generate a real-time 3D map of the car's environment - so they can be tested on roads that are like the real thing, but where nothing is left to chance. This video shows a simulated view of Mcity; the one further down is a brief glimpse of the real thing. In Mcity, the snappily-namedFusion Hybrid Autonomous Research Vehicle can be confronted with road users jumping red lights, nosing out of junctions too fast and generally driving like crazy people, but in a way that is safe for all concerned. The town has street lights, plus a whole raft of American urban planning terms that will mean nothing to our UK readers: 'crosswalks' (zebra crossings), 'lane delineators' (bollards, basically), 'curb cuts' (ramps), 'trees' (trees), 'hydrants' (those things water comes out of in America), 'sidewalks' (pavements),bike lanes,signs, traffic control devices and construction barriers. In fact, it looks like kind of a nightmare to drive around, if you're a human. Test surfaces in Mcity include concrete, asphalt, 'simulated brick' and dirt, with two-, three- and four-lane roads, plus ramps, roundabouts and tunnels. Ford has been testing autonomous vehicles for more than 10 years, and has various autonomous technologies fitted in its fleet already. The research at Mcity, however, is targetted at eventually putting more fully self-driving vehicles on our roads.